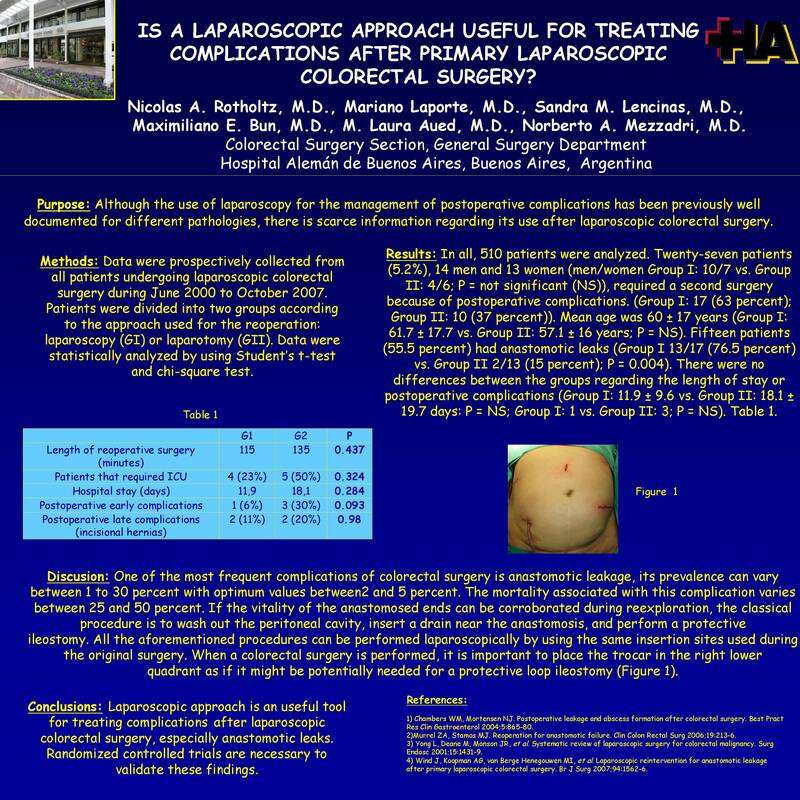 PURPOSE: Although the use of laparoscopy for the management of postoperative complications has been previously well documented for different pathologies, there is scarce information regarding its use after laparoscopic colorectal surgery. laparoscopic colorectal surgery between June 2000 to October 2007. Patients were divided into two groups according to the approach used for the reoperation: laparoscopy (Group I) or laparotomy (Group II). Data were statistically analyzed by using Student’s t-test and chi-squared test. RESULTS: In all, 510 patients were analyzed. Twenty-seven patients (5.2 percent), 14 men and 13 women (men/women Group I: 10/7 vs. Group II: 4/6; P = not significant (NS)), required a second surgery because of postoperative complications (Group I: 17 (63 percent); Group II: 10 (37 percent)). Mean age was 60 ± 17 years (Group I: 61.7 ±17.7 vs. Group II: 57.1 ± 16 years; P = NS). Fifteen patients (55.5 percent) hadanastomotic leaks (Group I 13/17 (76.5 percent) vs. Group II 2/13 (15 percent); P =0.004). The were no differences between the groups regarding the length of stay or postoperative complications (Group I: 11.9 ± 9.6 vs. Group II: 18.1 ± 19.7 days: P =NS; Group I: 1 vs. Group II: 3; P = NS). CONCLUSIONS: Laparoscopic approach is a useful tool for treating complications after laparoscopic colorectal surgery, especially anastomotic leaks. Randomized, controlled trials are necessary to validate these findings.